New Year's evening, after being forced to cancel a trip to the mountains for skiing due to balmy weather, my beloved and I discovered a wonderful animated film, The Secret of Kells. We were lamenting the reality that with hundreds of channels, outside of professional football, we have a hard time finding anything to watch. We generally strike out searching the on demand movie listings and neither of us have the patience or motivation to join NetFlix. A new year upon us, we decided to search again for a movie and while browsing the movie list, the word "Kells" caught my attention. Annie recalled that her brother recommended The Secret of Kells recently and after a quick preview, we ordered the movie and watched it twice! This is a perfect animated tale for children and adults with history, intrigue, good vs. evil, Vikings, Monks, fairies, the underworld, visionaries and manuscript illustration. The animation is wonderful, the artistic style fabulous and the story gripping. I imagine that the movie animator today was the book illustrator of yesterday. 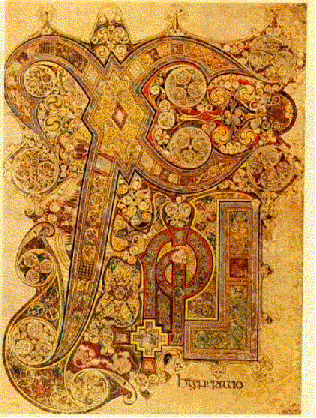 For the book lover, the reference to Kells is obviously to the great Book of Kells, a masterpiece of Medieval book illustration. Now on permanent display at Trinity College, Dublin, the Book of Kells, containing the four Gospels of the New Testament, is a major attraction for any visitor to Dublin. The Secret of Kells tells the tale of Brenden, a young, aspiring Monk, living in an Abbey under the direction of his Uncle, a stern taskmaster focused on completing the walls of the Abbey to protect against certain invasion by marauding Vikings. Brenden's life changes when the Monk, Aidan, a master book scribe and illustrator, arrives. Driven from his home on the Island of Iona, Aidan arrives with an unfinished and magical manuscript, the History of Iona. Aidan, too old to finish his masterpiece, discovers Brenden is a developing master of manuscript illumination and convinces the young man to risk his safety, disobey his Uncle and leave the Abbey to enter the magical forest in search of special oak berries for ink and a magical crystal necessary for the completion of the book. Brenden rises to the occasion and with the aid of a magical fairy white-wolf/young girl, Aisling, he finds the oak berries and the crystal. What happens after to the History of Iona and how this all relates to the Book of Kells, is best discovered by watching the movie! A wonderful animated film and certainly worthy of the 2010 nomination for an Academy Award. I am amazed I missed this last year but thrilled that my 2011 began with a viewing. Against the rising tide of animated toys, cars, crazies, and classic Disney characters, The Secret Of Kells is a touching tale that will generate many questions and introduce both young and old to the history of a world masterpiece, The Books of Kells. A five star review and a great way to spend 75 minutes. For an introduction to the Book of Kells and Medieval manuscript illustration generally, a nice paperback edition is available here . I find it remarkable than no print edition of The Secret of Kells has been published. The rise of the graphic novel continues and some wise publisher should take a risk and develop a print version.